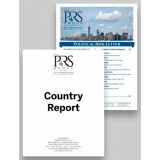 World Service is Political Risk Services' premier product, including a 12-month subscription to 100 Country Reports, as well as complimentary subscriptions to Political Risk Letter, and Country Forecasts. Available online ("PRS Online"). The ICRG Researcher's Dataset - Table 5B provides annual averages of the components of ICRG's Economic Risk Ratings (Table 5B), as published in the International Country Risk Guide since 1984. The ICRG Researcher's Dataset - Table 4B provides annual averages of the components of ICRG's Financial Risk Ratings (Table 4B), as published in the International Country Risk Guide since 1984. 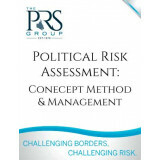 The ICRG Researchers Dataset - Table 3B provides annual averages of the components of ICRG's Political Risk Ratings (Table 3B), as published in the International Country Risk Guide since 1984. The ICRG Researcher's Dataset - Composite Risk provides annual averages of the composite risk ratings in ICRG's Table 2B, as published in the International Country Risk Guide since 1984. 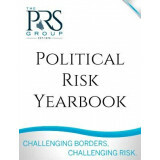 Political Risk Yearbook is an award-winning eight-volume set that includes all 100 of Political Risk Services' Country Reports. Published annually in January, and available in print, online, or on CD-ROM. 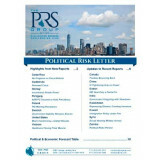 The online version of Political Risk Yearbook is also available for campus-wide access. 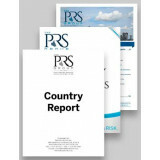 A monthly newsletter that summarizes the latest PRS forecasts for economic and political changes affecting international business, as well as including, in each issue, the Political and Economic Forecasts Table, which includes 18-month and five-year forecasts for turmoil, investment, transfer, and export risk in all 100 countries and forecasts of real GDP growth, inflation and current account. Price includes delivery, but appropriate taxes will be added. 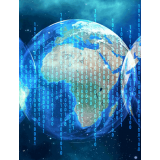 The IRIS Dataset was originally constructed in 1993 by Steve Knack and Philip Keefer for the IRIS Center at the University of Maryland, based on data obtained from the International Country Risk Guide. Free Political and social data for 100 countries from Political Risk Services.